Gradually I worked my way through everything written by the enigmatic author hiding behind the wonderful pseudonym Elena Ferrante. I was captivated by the honesty of her storytelling, the sharp language and style, and naturally and quite predictably, what got me hooked was the fact that Olga, her protagonist, was a translator. By the time the English translation of My Brilliant Friend, the first part of the Neapolitan saga, appeared and was first noted by James Wood in the New Yorker a few months later, I’d been a publisher for two years. The first time Ivana and I actually met—she was then translating Antoine Laurain’s book The President’s Hat for INAQUE—we discussed Italian literature and of course Elena Ferrante’s name came up. We realized that most of the books we both loved were written by women. At that point I had already drawn up a list for a series featuring women authors who present the female experience in a universal, human context. Elena Ferrante was a perfect fit because of her writing style, themes and narrative scope. In a café, as Ivana recounted the plot of a part of the Neapolitan saga that hadn’t even been published, the waiters thought she was talking about her Italian acquaintances because we were discussing individual characters as if they were real people. I would have loved to commission Ivana to translate Elena Ferrante straight away but was able to promise only that the Neapolitan Saga would be next on the list. Starting out as a publisher wasn’t easy. I had some idea of the kind of books I wanted to publish but I was surrounded by people who felt a constant need to offer their advice and talk me out of various projects. Now, I know that the Slovaks are expert at everything and there’s no way of pleasing them all. The books I publish in INAQUE are not of interest to the commercial market because of their small print-runs, while academics dismiss them as mainstream “bestsellers” jumping on the latest trendy bandwagon (I have also published Michel Houellebecq’s essays, among other books). 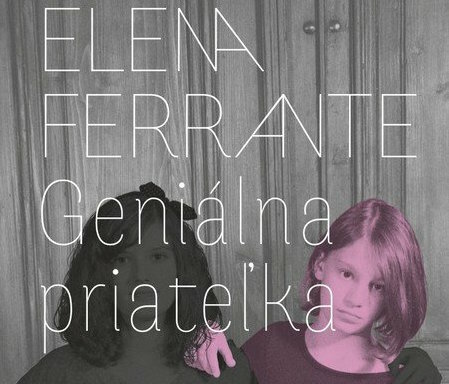 Ivana Dobrakovová: I first came across Elena Ferrante in Czech translation, in an anthology of Italian literature entitled Gutenbergova čítanka (Gutenberg’s Reader). It was an excerpt from The Days of Abandonment, the scene in which Olga inadvertently locks herself in her apartment and can’t get out. It was a text that stood out above everything else in the anthology and I immediately got hold of a copy in Italian. The novel swept me off my feet and ever since I always cite Elena Ferrante as evidence that what really matters is not what you write about but how you write about it. For what could be more banal and “ordinary” than the story of a woman who suffers a breakdown after her husband leaves her for a younger woman… However, Elena Ferrante was able to portray this stereotypical situation in a way that draws the reader more and more deeply into Olga’s hallucinatory states, a kind of feverish accumulation of increasingly awful situations, until the reader feels like shouting ‘Stop it, it can’t go on like this, there’s no way any more of this can happen!’ Later I re-read the novel because as a writer I was interested in the linguistic devices Elena used to achieve this effect (for example, the vulgarisms that begin to pervade Olga’s vocabulary as she imagines what her husband is up to with his mistress, the terrifying “honesty”, the sort of unfiltered writing without any self-censorship, like the occasion a mother thinks she can hear that her daughter crying on the balcony needs her, but at that moment her daughter is the last thing on her mind), and later I read all of Elena Ferrante’s books. I saw the film adaptation of The Days of Abandonment but didn’t find the film as interesting. I thought the book was much more convincing and truthful in the way it captured the force of the pains experienced by an abandoned woman. The other thing I loved was that the novel is set in Turin, a city that has been my home for ten years now. It even includes some specific locations, like the Parco Valentino, and so for several years, every time I walked past the Borgo Medievale, I kept wondering where exactly it might have taken place… Elena from the Neapolitan saga also moves to Turin, somewhere around Ponte Isabella—not far from where I live. So of course I set my heart on translating Elena Ferrante and was hoping that our agreement with Aňa would come to fruition. That year I translated Antoine Laurain for INAQUE and, before that, novels by Emmanuel Carrère, Maxence Fermine and François Soulages for another Slovak publisher. JS: How have readers in Slovakia and Italy, the countries where you two live, responded to Elena Ferrante? Was the response comparable to the Ferrante fever raging in the Anglophone world? AO: So far only the first part of the Neapolitan saga has appeared in Slovak, the second part is due out soon, so it’s too early to talk of a response from Slovak readers. Some readers have e-mailed me at the publishing house to welcome the Slovak translation as they had come across the author’s name while on holiday abroad, and were aware of the hype. Let’s not forget that even in the US the Ferrante fever only started following the publication of the third part of the saga (i.e. Ferrante’s sixth novel to appear in English). The Slovak media don’t cover literature very much nowadays so it takes some time for the news of publication of a novel to filter through the social media and into bookstores. Furthermore, Slovak literary culture is quite resistant to this kind of fever. I’ve discussed Elena Ferrante’s novels at length with any number of foreigners who have confirmed the universality of her novels, and there are also numerous historical links between Slovakia and Italy, yet I am sometimes astonished by the huge chasm that exists between Slovak literature and literature in translation and at how dreadfully navel-gazing our part of the world is. As I said earlier, INAQUE inhabits a no-man’s land—we’re not commercial enough for the commercial market but too mainstream for academics. In addition to this, novels written by women and focusing on women’s themes are treated as chick lit. Basically every novel I publish, every short story collection, is received as if written by a totally unknown author and I can only hope that the power of the prose and the narrative and a pleasing graphic design will attract potential readers in bookstores. ID: In Italy Elena Ferrante is widely read and her books sell well but it seems to me that in terms of reception the media are too obsessed with her pseudonym. This became evident, for example, when La Frantumaglia, a book of interviews with her appeared. Nearly every interview began with the question—‘Who are you? Why won’t you tell us who you are?’— and only later did the journalists move on to her books, almost as if these were something secondary. Newspapers have been speculating for years who might be hiding behind the pseudonym Elena Ferrante. Various people have been suggested, sometimes on the basis of comparative textual studies, most often male names—it’s even been proposed that her books are written by several male authors, or that the author is a homosexual or a transsexual because of his deep insight into female emotions and way of thinking. (You see, the most obvious explanation—that she might be a woman —is always the last hypothesis to be proposed, because surely a woman couldn’t possibly write something as powerful and effective and, to paraphrase Elena Ferrante herself, only a male with his male strength could show this kind of insight. On the other hand, when was the last time you heard anyone suggest, in relation to an author writing under a male pseudonym, that his book may have been written by a woman or a female collective?). Sometimes I think that this whole pseudonym business has been harmful because I’ve come across people who have heard of Elena Ferrante: ‘Oh yeah, she’s the one nobody knows who she really is’, but the same people knew nothing about her work. The woman in my favourite bookshop who knows that I’m translating her also keeps asking me—‘So have you found out who she is?’ No, I haven’t. And even if I knew I don’t think it would change anything because it would just be a name that most probably wouldn’t mean anything to me. At the same time, as I follow the US hype and all the Ferrante fever from afar, I feel that things are quite different here. Yes, she is acclaimed, but you also hear criticism, partly because of the pseudonym, which is considered some sort of a mean joke or a game that has gone on too long, and partly because, basically, on the home turf you find more rivalry among authors. And success, particularly in the US, is something people find hard to forgive. For instance, people have argued about whether she can be nominated for Italy’s most prestigious Strega Prize or not, because who would collect the prize on stage? In fact, she has been nominated once before, for her first novel, but she wasn’t so well known then, so I guess it wasn’t such a big deal. JS: Does the fact that Elena Ferrante doesn’t appear in public affect the translation and promotion of the book? AO: I find the mystery surrounding the author, her reluctance to present herself other than through her published books, very impressive. I imagine it is must be liberating for her as an author. As far as I know, she communicates with her publishers and translators by e-mail through her agent. In Slovakia, authors of literary fiction don’t enjoy cult status. Although Slovak authors do give interviews and appear in public, events where the author is represented by their translator are very rare. ID: I can also understand why Elena Ferrante has chosen not to publish under her own name and not to promote her books in the media. Every author exercises a certain degree of self-censorship and I’m sure some things are easier to write under a pseudonym, especially when it comes to the issues she covers, such as motherhood. But that doesn’t mean she is not interested in her books, that she doesn’t identify with them, or that her translators are forced to consult with each other because the author is inaccessible. After translating the first novel I sent a letter to Elena Ferrante via her agent since I needed to consult her on one particular point. And I did get a reply. I have the advantage of being based right here in Italy so if I need to research something I can often just ask around. Having said that, even though she rarely uses dialect, from time to time words typical of southern Italy or issues relating specifically to Naples do crop up in her work, things people in Turin might not be familiar with. But this happens very rarely and I can find most things on the Internet or, if necessary, I ask a southerner, for example a neighbour of mine who comes from Naples. Ivana Dobrakovová, the translator of Elena Ferrante, is a writer based in Turin. She studied translating and interpreting (English and French) in Bratislava and now works as a freelance translator, mainly from French and Italian into Slovak. Her first book, a collection of short stories Prvá smrť v rodine (The First Death in the Family), appeared in 2009, her novel Bellevue was published in 2010, and was followed by the short story collection Toxo in 2013. A winner of two literary competitions, all three of her books have been shortlisted for Slovakia’s most prestigious literary award, Anasoft Litera, and translated into Hungarian and Polish. Her books focus on young women, often expat students or volunteers, and young mothers.